The lightweight toilet trainer is easy for your child to put on or take off without assistance. The toilet trainer can then simply be hung up by the practical handle on the back. Older children can easily sit down on the toilet trainer unaided thanks to the clever design. However, you should always help your child to climb up and down from the seat until it is safe for the child to do so alone. The toilet trainer can be used on most toilets and only needs to be adjusted once. After that, it will safely rest on the toilet seat every time. If you want to take the toilet trainer with you, it can be easily adjusted to fit onto another toilet. The inbuilt, inward-facing splashguard of the toilet trainer will prevent spills, which will increase your child’s confidence and minimize cleaning after each trip to the toilet. Age: Toilet and potty training is very individual, so it is hard to recommend a suitable age. The toilet trainer can be used once the child feels ready. NOTE! Not suitable for children under two years. Help your child to climb up and down from the toilet trainer until it is safe for the child to do so alone. 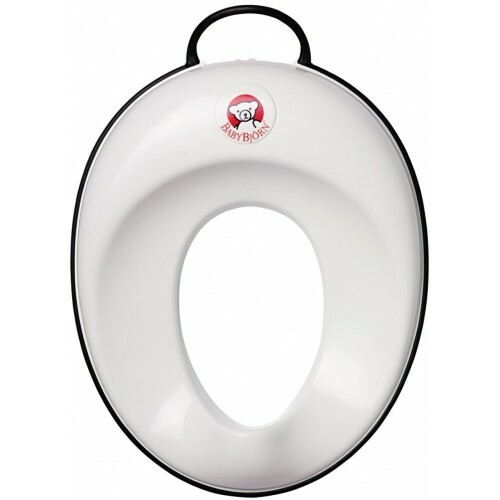 Material: The toilet trainer is made from polypropylene (PP). Product care: Wipe clean or rinse under running water. Hang up the toilet trainer by the handle when not in use.